Enerpac (A Division of Actuant Corp) presents a range of hydraulic bead breakers designed to take the risk and effort out of changing tyres on tractors, trucks, graders and implements. Designed for vehicles and implements used in the construction, civil engineering, farming, heavy industrial, oil and gas, mining and energy, primary industry, quarrying and transport industries, the 700 bar EBB 400 (45 kN) bead breakers use precisely applied high force from easily handled tools, eliminating the need for heavy, clumsy, labour-intensive equipment. In addition to saving time during routine workshop maintenance and on-site repair operations, the bead breakers protect staff and machinery. 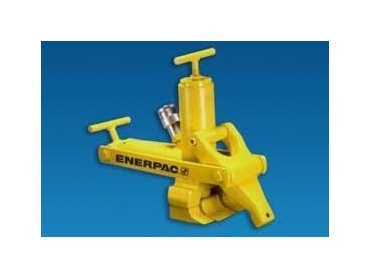 The hydraulic bead breakers are compatible with some of Enerpac’s most commonly used pumps throughout Australia and New Zealand, including air/hydraulic pumps, electric/hydraulic pumps, as well as foot pumps, POW’R-RISER portable lifting jacks (54-181 ton) and the latest multipurpose Ultima hand pumps. Enerpac bead breakers are part of Enerpac’s advanced range of safety-oriented, energy-saving and labour-saving technologies, including lifting, pumping, fastening, bolting and maintenance tools. Enerpac’s high-pressure hydraulic products are distributed worldwide.